It is a condition in which blood starts flowing between 2 outer membranes of brain and these membranes are periosteum of skull and the membrane which covers the cranium upper part. The membrane which covers cranium is a thick layer and hard on touch and is known as galea aponeurotica. The bleeding can also involve the posterior eye part and ear laterally. Blood started accumulating in space between these 2 membranes. Subgaleal hematoma is also known as subgaleal hemorrhage. Not only bleeding occurs, it also causes swelling in the skull portion. It is considered as fatal condition in infants. This bleeding can occur as a result of inappropriate delivery of newborns and delivery with the help of vacuum suction pump. Occurs mostly in newborns and adults can also suffer from this condition due to any head injury. Basically bleeding occurs when the veins supplying blood between galea aponeurotica and skull’s periosteum get rupture. In newborns, the amount of blood can be stored in skull is about 260 ml. due to this disease the most of the patients die and some of them become the patient of hypovolemia. Subgaleal hematoma occurs in newborns in a ratio of 1.5: 10.000 births. This condition normally occurs in newborns, who are delivered with inappropriate method and who are delivered with the help of suction pump. About 90% of newborns who suffer from subgaleal hematoma are delivered through vacuum assistance known as Vento use assisted delivery. But in adults the most common cause seen is head injury and 40% of head traumas lead to subgaleal hematoma. The patient who are already suffering from fractures in skull and hemorrhage in cranium are more susceptible towards subgaleal hematoma. But all these causes and factors does not tell about the severity of the condition. In subgaleal hematoma, the most commonly used technique is computed tomography scan (CT scan). 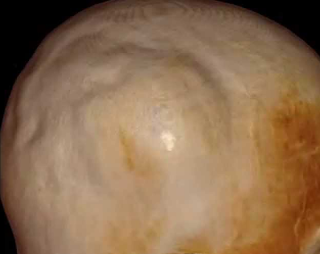 The head appears to be abnormally shaped and swollen. In some cases the subgaleal hematoma is one sided and in CT scan only one side appears as white in color which shows the presence of blood. If both sides are involved then the whole skull appears white in color showing fluid. Fluid level is also shown in the report of CT scan. The thickness of blood accumulated between membranes is also indicated in reports. Some of the reports are mentioned below for well understanding. As trauma is considered the major cause behind subgaleal hematoma. And this trauma can occur in many ways. Subgaleal hematoma do not show symptoms the very next day of trauma, it took 7 to 8 days to appear. Mostly head trauma occurs due to the use of vacuum suction pump during the delivery of infants. It can also occur in newborns with presumed head trauma. The reason behind this trauma is the application of forces may be radial or tangential on to the blood vessels which supply blood to the cranium and its upper membrane called galea aponeurotica. Treatment of subgaleal hematoma consist of phototherapy and Fluid bolus. In case there is severe blood loss patient needs I.V fluids to correct fluid imbalance. Similarly, phototherapy is utilized to drain back accumulated blood. Patient requires intensive care for 72 hours in case of subgaleal hematoma in order to avoid further complications.